Industrial accidents are something to fear. Whenever you’re on the job, there’s a strong chance that the office or factory equipment is going to turn on you. How easy is it for a dinged up office chair to collapse and throw you onto the floor. You hit your head against the metal veal pen corner and you’re bleeding out like calf at the slaughterhouse. No matter how “safe” you imagine your job, there’s something in there at that can kill you. The Mangler pushes the dangers of working at an industrial laundry service with the help of Stephen King, Robert Englund (Freddie Kruger), Ted Levine (The Silence of the Lambs) Tobe Hooper (The Texas Chainsaw Massacre). Gartley’s Blue Ribbon Laundry almost looks like a place straight out of a Charles Dickens novel. The employees do things the old fashioned way as they do industrial sized cleaning. In the middle of the ancient building stands a massive machine from what seems like the industrial revolution. The employees hand feed the wet bed sheets inside so they can be dried and folded. It’s a dangerous operation and Bill Gartley (Englund) oversees it from the catwalks. He might have had his own run ins with the machine as his limps are inside numerous braces and he wears an eye patch. It’s a dangerous life in the laundry world. Things get dangerous quick when Gartley’s niece cuts herself on the machine. But she survives. Although shortly after that another employee isn’t so lucky when she gets caught after the safety shield malfunctions. She gets squished and folded. It’s not a pretty sight when Police officer John Hunton (Levine) arrives to investigate what went wrong. He fears there’s something seriously wrong when an old icebox attempts to eat his brother-in-law (Daniel Matmor). The duo stumble upon what appears to be a human sacrifice scheme involving the machine. How deep does this industrial accident plot go? The Mangler wasn’t a hit when it came out in the Spring of 1995. It wasn’t a case of horror not having any box office pull since a few weekends later Candyman became a hit. But somehow the teaming of Tobe Hooper and Stephen King didn’t lure horror fans to the local cineplex. The mix had worked for Salem’s Lot on TV back in 1979. Perhaps this was a case that people already feared enough getting sacrificed at work to a machine. They didn’t need to pay $10 to prove their fear is justified. But they missed out on a fine taste of industrialized terror. Robert Englund goes beyond being Freddie Kruger. He nails the character of heartless laundry plant owner who doesn’t care who gets hurt as long as the mechanical elements run properly. Ted Levine proves he could play the law after being the ultimate of evil as Jame Gumb. He’d later keep this up on Monk. Daniel Matmor really works well with Levine. He’s charming as he selling the idea that the machines are demonic. 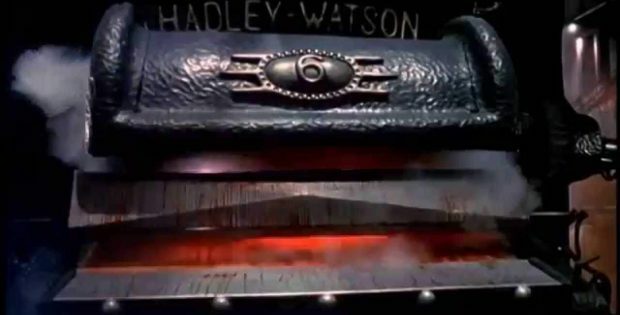 The Mangler did prove to be a hit on video since they made two straight to video releases. The Mangler gets deep not that fear of getting sucked into a machine that you swear hates you. After watching this film, you’ll stick to wash and wear clothes. The video is 1.85:1 anamorphic. The transfer’s resolution brings out the nightmarish elements of the Mangler machine. The audio is DTS-HD MA 5.1 and 2.0. The creaking nature of the Mangler comes out of the speakers as the chains crank. The movie is subtitled. Audio Commentary features co-screenwriter Stephen David Brooks. He speaks a lot about his time working with Tobe. He was on the set during the production. Actors were warned to stay away from the Mangler. He also has fun pointing out little details that didn’t go right because it was in South Africa including a bizarre mailbox on the street. Gartley’s Gambit with Robert Englund (22:40) has him tell stories from the South African set. Tobe Hooper enjoyed getting to work at the bottom of the globe. He shares how a Michael Jackson tour had a major impact on the film. His character’s braces are linked back to Orson Welles. He talks about the fear of working with The Mangler since it was a real machine and not a CGI creation. Behind the Scenes Footage (12:42) has Tobe Hooper and his crew filming around the giant warehouse location and the machine. Theatrical Trailer (1:26) is the Red Band version. They sell us on the three modern masters of horror being part of the terrorizing film. TV Spot (0:33) makes us fear industrial laundry operations. Scream Factory presents The Mangler. Directed by Tobe Hooper. Screenplay by: Tobe Hooper, Stephen David Brooks & Peter Welbeck Starring: Robert Englund, Daniel Matmor, Ted Levine, Vanessa Pike, Jeremy Crutchley and Lisa Morris. Rated: R. Running Time: 105 minutes. Released: December 11, 2018.